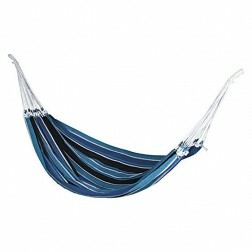 Made with EllTex material which is UV resistant, the Samba Single Hammock boasts absolute minimal fading and is tear-proof even after heavy rain and shine exposure. 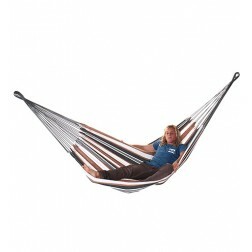 The Samba Single Hammock is a sturdy hammock with solid timber spreader bars, and features material that is made of weatherproof and UV-resistant EllTex, which adds to its extra long lasting durability and yet makes it feel as soft as cotton. 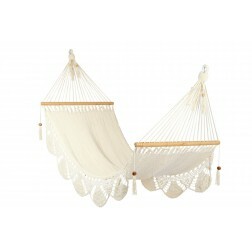 Hang this hammock outside even in heavy rain or the burning hot sun! The Elltex material is a special mix of polyester and cotton that is totally weatherproof – UV resistant, and has absolute minimal fading and is tear-proof – even after getting repeatedly wet. 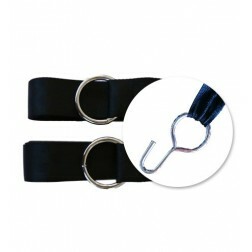 The hammock comes packed in a handy travel bag with carry strap. Purchase one of these great hammocks today as a gift to yourself, a family member, or as a gift to someone who really deserves a memorable thankyou present. Pick one up today and have it delivered free to all metro areas in Australia.